The renewables sector is one of the fastest growing in the UK with onshore wind farms and solar farms becoming an increasingly common site. It is essential that the underground cable entries on wind and solar farms are effectively sealed to prevent water flooding into the site kiosks and substations, especially when the construction is on a flood plain or an area with a high water table. Whether you are in the process of designing/constructing a new site or if you have a problem with water ingress into your kiosks or site substation we are able to help. We can engage during the design and construction of a site to recommend, supply and install appropriate cable entry sealing technology, ultimately saving time and money by ensuring it is done right first time. We can also retrofit flood defence cable duct seals, if you have a problem on site and are looking for a solution to the water ingress. We are experienced in sealing failed cable entries see our sealing failed cable entries page for more information on our abilities and experience. Protecting substations from flooding reduces humidity levels in kiosks and substation buildings. High humidity can cause partial discharge and switchgear to malfunction; therefore preventing water from entering a kiosk or substation is a high priority for renewable energy sites. 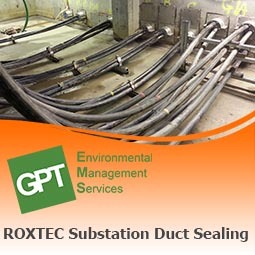 We can utilise a range of technologies to seal ducts into substations on renewable energy sites depending on site specific conditions/requirements. We have a mechanical system ROXTEC and a mastic type sealant CSD RISE (for more information on the systems see the individual pages).